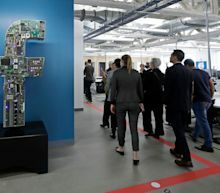 Facebook stock rose Tuesday to a 27-month high, just ahead of its first-quarter earnings report coming after the market close Wednesday. The consensus on revenue is $14.97 billion, up 25%. Steve Kovach, CNBC's tech editor, and CNBC's Julia Boorstin, join "The Exchange" to discuss Twitter's strong quarterly earnings and what it could mean for other tech stocks announcing earnings this week.